Released on St George’s day this is our take on a classic Guy Richie movie. Inspired by Sting’s bar in the film, JD’s. With the logo on 1 breast and the England flag on the other it makes for an alternative t-shirt to cheer on England in the 2010 World Cup!! 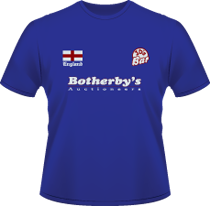 In centre chest we have incorporated the Botherby’s Auctioneers logo (a take on Sotherby’s in the movie) to keep the 'football shirt feel'. Navy Super Premium t-shirt with a red and white design perfectly printed.